Artwork Panel: 30.6cm x 45.2cm ≈ 12" x 17¾"
Silk/Brocade: 40cm x 108.5cm ≈ 15¾" x 42¾"
A Samurai battles a foe, stepping on his head, while more attackers and weapons fly through the window. A customer commissioned me to make a reproduction and wall scroll of this ancient woodblock print. I made an extra one just in case the first did not pass inspection. But all of them were perfect. 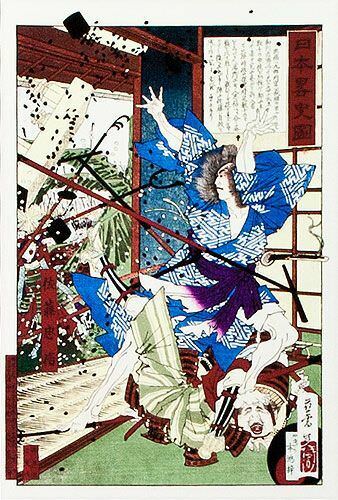 This is an extra, and I have priced it lower than I normally would because I don't have a lot of information to go with this print (I don't know the artist, or which Samurai it depicts, nor who the Samurai is battling). I used a special unryu kozo paper. This is a special paper that has a lot of white kozo (mulberry) fibers running through it. It's very cool-looking in real life, though hard to see this special fiber texture in the images here.